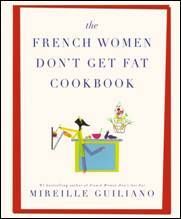 I was offered to review the French Women Don't Get Fat cookbook by Mireille Guiliano. I love doing review for new cookbooks, it gives me new ideas for recipes for my family and I like sharing them with you! After redefining the very notion of a “diet book” with her mega-bestselling French Women Don’t Get Fat, Mireille Guiliano now offers her first cookbook ever—a complete set of her mouthwatering, simply prepared recipes that are the cornerstone of her philosophy on living life well. The former CEO of Clicquot, Inc, Mireille believes eating should be a pleasurable—even sensual—experience and that you shouldn't have to spend hours in the kitchen creating complicated recipes. Organized around Mireille’s self-proclaimed three favorite pastimes, Breakfast, Lunch, and Dinner, THE FRENCH WOMEN DON’T GET FAT COOKBOOK is replete with recipes that center on the pure flavors of quality ingredients that result in meals that are highly satisfying with minimum stress and effort (and no unwanted fat). I decided to make her Chicken En Croûte Fiona Style and Milk Jam. This chicken is not wrapped in pastry as En Croûte means, but is encrusted in a citrus with Parmesan and fresh herb mixture. I guess that's the Fiona style? Let me tell you, this smelled SO good baking! All that citrus and fresh herbs, Mmm! The recipe is fairly simple and bakes in just 20 minutes! I really liked it and think it's be fabulous on top a salad. Everyone else said they liked it and said Yes I should make it again (but I think I'll cut the lemon/herb amounts in half, they were a tiny bit overpowering). I call this fancy restaurant-company worthy chicken. 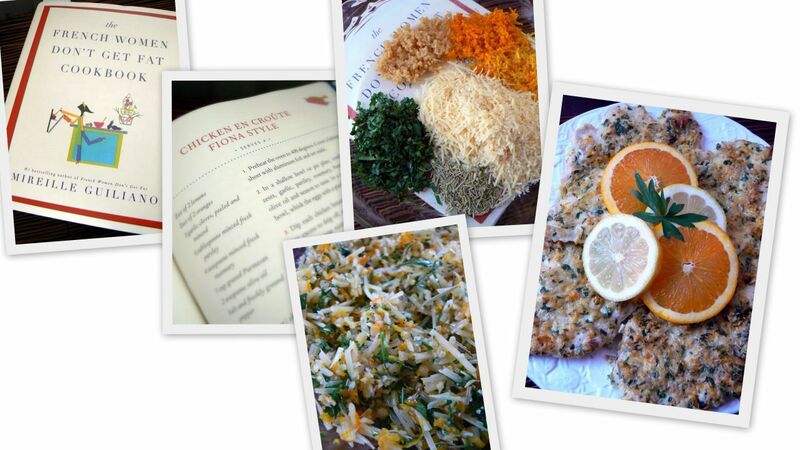 I looked through her whole book and decided upon this recipe, so glad I did! Preheat oven to 400 degrees. Cover a baking sheet with aluminum foil; set aside. In shallow bowl or pie plate, combine zests, garlic, parsley, rosemary, Parmesan and olive oil and season to taste. In a second shallow bowl, whisk the eggs with a pinch of salt. Dip each chicken breast in the egg, allowing any excess to drip off, and then dip in the citrus-herb-Parmesan mixture, pressing to lightly coat each side. Place the chicken breasts on the prepared baking sheet and transfer to the oven. Bake for 20 minutes or until the chicken is done. Remove from the oven and serve immediately with lemon slices and a green salad. I also made her Milk Jam recipe which is basically a dulce de leche spread. This did not turn out for me. It hardened quickly and became crystallized and wasn't easy to spread. I wrote this review for "Mommy? I'm Hungry!" about French Women Don't Get Fat. I received free product to keep for this review. All opinions for this review are that of myself & family. Product info & stock images provided by PR. Wow, that looks absolutely delicious! thanks for including the recipe! I think I may have to pick that up. It's only $16.49 on Amazon, def not a bad price for a cookbook!